There has been a lot of discussion about the total cost of ownership of home semi-professional grade photos circling around the internet, and after a year of ownership I’m finally ready to throw my hat into the ring when it comes to costs regarding the relatively common Canon Pixma Pro-100. The biggest problem with tracking the cost of ink for a printer, in my opinion, come from three different sources. With these issues in mind, I set out to attempt to track my costs as accurately as possible over a year of ownership, starting the day I opened the box. I built myself a spreadsheet to track every single print and maintenance event that occurred over the year. 2. To control for ink used in maintenance, I recorded the date of each print, and tried to go no longer than 10 days between prints. I cannot stop the printer from doing maintenance cycles, but I can control how often they happen. Because they are a regular part of owning a printer, I am happy to include this cost as part of the total cost per square inch. 3. Inconsistent tracking is often due to printing non-images. A common practice is to print test-pages rather than full images as part of printer head maintenance cycles, but I believe this could skew ink usage. I made sure to print images, even if they are just 8.5x11, as part of my weekly printing. For every print, I recorded the print number, date, image size, image filename, paper, and print quality. I avoided printing nozzle tests or other such test prints, and almost exclusively printed photos. This was to ensure that my printing represented accurate photo printing costs. After each print session, I recorded the level of each colour remaining in the tank. While the reported ink status is only to the nearest 10% (and shown only in graphical form, thanks Canon), under-reporting by 10% on all 8 colours results in only a 3.06% change in the final cost per square inch. Under-reporting just 1 colour by 10% results in a change of 0.36% in the final cost per square inch. This does add a level of uncertainty to this work, but with the sample size here I don’t think it causes a major issue. When I needed to replace an ink tank, I updated the ink level to 100% and added 1 to the count of empty ink tanks, which gave me a total number of ink cartridges used. For each print, the image size was multiplied to give a square inch size. These were then summed to give a total number of inches printed. At the same time a separate sheet totaled the number of empty cartridges and added the amount of ink missing from each colour still in the printer. This gave me a total amount of ink used. To come up with a total cost of the ink used, the price at the time of purchase of each colour was recorded. To make sure that sale prices didn’t unduly affect the total average cost, the price is not averaged per colour, but rather per cartridge. The total cost of ink used is then calculated by multiplying the average cost per cartridge by the cartridges used. Finally the total cost of the ink used is divided by the total square inches printed. In the same way, I also tracked the paper I purchased and used a similar system for calculating the total expenditure for each paper type/size. I won’t get into paper costs too much, as it’s fairly straight forward to figure out ahead of time how much it costs. In the end, the total cost per square inch landed at $0.02076. I ended up using MOAB’s 300gsm Exhibition Luster for most of my prints. I loved the look of it and the price point. It was also readily available at both of my local camera stores, which made it easy to not have to carry a large stock. I have had a couple prints that I’ve had to throw out. · One was because I accidentally put a finger print on my paper and then the ink didn’t stick, leaving a ghost finger print in the middle of my image. Solution: bought cotton gloves to handle the paper before and after printing. · One print, number 252, splattered yellow ink across the print. Solution: ran the nozzle cleaning then nozzle check cycles. Haven’t had a problem since. · A variety of prints that were printed with incorrect settings. Problem existed between chair and keyboard. I love the print quality that this printer produces. By far the weakest link is my own capability as a photographer and not the printer. I’m also extremely happy with the cost of ownership of this printer. There have been 0 breakdowns over the course of the year, and it continues to print great print after great print. 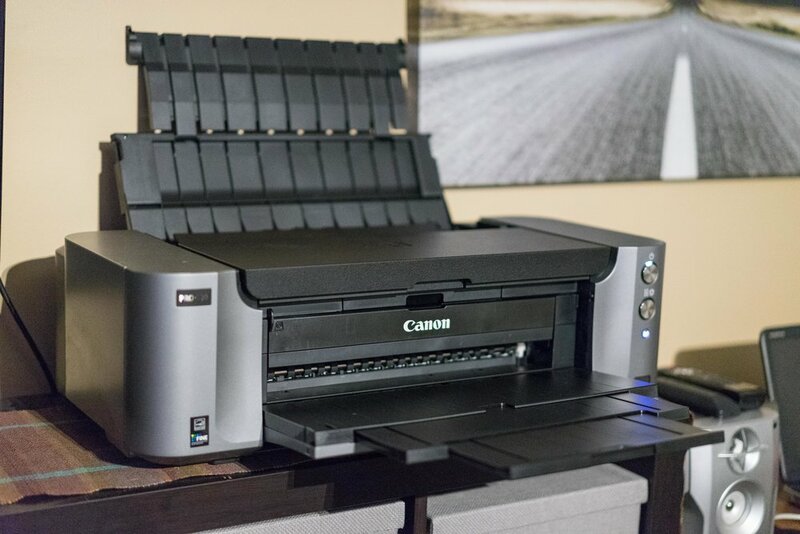 If you are a hobbyist, or even getting started as a professional, this is the printer for you. I hope this helps give a better picture of how much it costs to operate these types of printers! That being said, I am working on selling my Pixma Pro-100 because I’ve upgraded! I wanted to print even bigger, stay tuned for details!